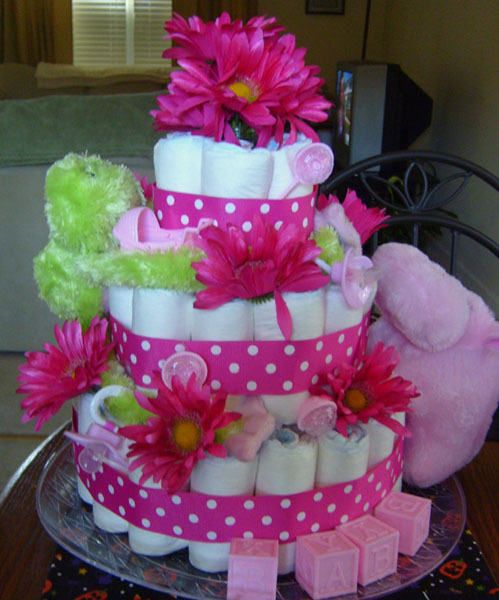 Fun Flower Diaper Cake for a Baby Girl! Check out this very pretty flower diaper cake! I love the bold pink ribbons and flowers. As you can see in the picture below, a great way to dress up your diaper cake design is to add some flowers. Take a look at Heather's diaper cake recipe below. She submitted a picture and some explanation of her diaper cake, and are we ever glad she did! Heather is one of our amazing contributors to the quality of this website who have made this diaper cake gallery the best diaper cake resource on the web! Thanks a million, Heather! I used a pack of 56 diapers from walmart. I used parents choice brand and they were only about 6 dollars. I got the fake flowers from walmart 2 bunches for a dollar. The ribbon came from Walmart and was about 3 dollars. The pacifiers were 96 cents for two from Walmart and the two bottles used for the middle was only 98 cents each! The stuffed animals and light pink baby girl decorations came from the Dollar Tree! I think all in all I only spent under 20 dollars. The mom to be loved it! Heather - What a pretty diaper cake for a baby girl! Thank you for sharing!! Ever thought about making your own diaper cake? Click Here for easy-to-follow diaper cake directions with step-by-step photos!